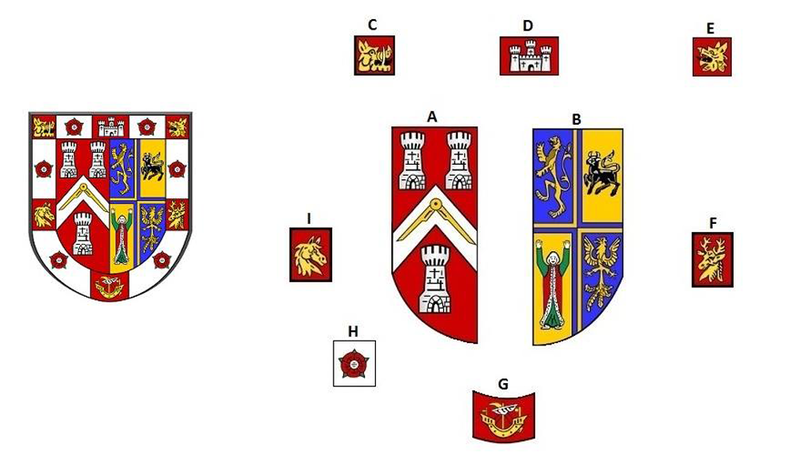 A number of years ago Keith Dibben explained the features that make up our Provincial crest. Below is a dissected image of the crest with it's features explained for our younger Brethren. The coat of arms of the Premier Grand Lodge founded in 1717. These arms were borrowed from the Worshipful Company of Freemasons of London which had been granted to them in 1742.This livery company represented Stonemasons. The coat of arms of the Atholl of Antients Grand Lodge founded in 1751 which was until 1813 in competition with the Premier Grand Lodge. The four figures depicted are believed to represent the banners of the four principle tribes of Israel, which are symbolically important in Royal Arch Masonry. The man is said to represent Reuben, the Lion Judah, the Ox Ephraim and the Eagle, Dan. The Head of the Hampshire Hog. A symbolic representation of Carisbrooke Castle, symbolising the Isle of Wight. The Head of the Dragon of Wessex. A Galleon symbolising the Ports of Southampton and Portsmouth. A Horses or Pony's head again representing the New Forest.